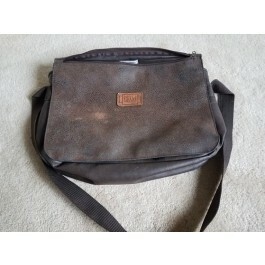 Sienna Collection leather bag for sale. This is listed as "leather". There are no tags stating that it is leather. It does look like leather although we cannot be 100 percent sure. $25.00 - free shipping to US customers only. Sienna Collection leather bag for sale. $25.00. Free shipping to US customers. There is a small tear or hole in the outer flap portion, see pictures.